Miscellaneous Wanderings: Why do I (we) trek, ride, jump & climb? Why do I (we) trek, ride, jump & climb? So, it boils down to the basic question? Why do I trek, cycle, climb mountains or get away from the creature comforts of a metro, away from family and friends, kith and kin and subject myself to such physical efforts and mental isolation? I remember my first steps out into the mountains. It was 26th January 1995, just after securing a comfortable job, post an MBA course. 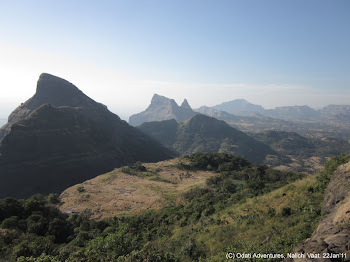 We had chosen, what today may be defined as a moderate or difficult trek in the Western Ghats of India. I recollect the thoughts that crossed the mind on the way down. "I like this! I will do it again"
Not too many months later I found myself on the same trail downhill toying with same thoughts. I liked it again. Was it the awesome appeal of nature, was it friends or the company, was it the air, was it the feeling of exploring, was it the achievement of trailblazing newer routes which only few choose to walk, or was it me? All these were positive inputs. But then, was I trying to get away from it all, keeping relations at an arms length, keeping work worries away, keeping the urban buzz at bay, or scared of the big fat race in the middle? In another couple of years, I had launched myself fulltime into the outdoors, so most of the latter worries disappeared too. Then, what made (and continues to make) me go back week after week, doing the same trails, cycling paths again and again enduring the efforts and at times the pain? This is difficult to pin point! Over the last few years I have been riddled (and overwhelmed) with the same question. But over a lot of discussions and deliberation within and with our friends, here is what I come up with! Primarily there is no denial that it's nature that works the magic. But that's the external influence. An intrinsic and an all encompassing factor that may be driving me (and maybe most of us) is to do more with the way i deal with my past and future. I believe both our past and future are always a cause of worry and anxiety for us. We carry a lot of burden of our past and let it impact our current action as much our future worries us. Trekking, cycling, rappelling, rock climbing, mountaineering, rafting, sky diving or any such activities have the ability remove ourselves from these time lines and let us be; focus on what is our present. Nature and the activities engage our minds in a manner that all the cloud and clutter of thoughts part ways; the only thing that matters in our mind is the step we are taking. This feeling of removal from the past and future, I am sure, can be extrapolated to other hobbies, activities, vocations and for some, even regular work life. A challenge or an action is the most joyous if it has the ability to absorb you and makes you experience your immediate present. All relations, bonds, attachments, yearnings, greed etc fade into the nothingness of such an experience. Recently we returned from a grueling expedition, where our challenges were unknown, we thrust ourselves into complete isolation with no phone calls and contact with the outside world, atop 6200Mtr passes. Initially many team members grew uncomfortable with the isolation, but soon enough, we gelled well and focussed on the everyday challenges. I had forgotten about the outside world and what lay ahead of me were only the hurdles, people who mattered and the limited resources to our disposal. That meant a lot to me. As we weaned back into civilization, i remained in the zone for longer (and so did some others) as i did not want to connect back to the real world. I did not want news from family, friends, work, people as it meant that I re-establish relations with my past and future. Not worrying about it was the real joy! The present truly teaches you things that you never knew existed, has no answers borrowed from the past or make no presumptions about the future! Another aspect that this 'joy of the present' transcends is the fact that while you live your present, it does not matter who you are, where you come from, what's your social position and what your physical and mental state is. Once you assimilate this, no challenge is big enough for your mind and body. The physical self is ready to take it all. It easily changes to a mind-over-body experience. Keeping in shape, making friends, enjoying the small pleasure of nature, taking in the experiences, bonding with self and others, now seem a necessary but an essential part of the overall package. I know it's unfair on all my dear ones around me as I embark on such journeys very so often, but guess that defines who I am! thanks anand! precisely! magar aap toh in sab celebrity ke adheen lag rahe ho!